Also Contains: Cellulose, vegetable stearic acid, modified cellulose gum, water-soluble cellulose, titanium dioxide, silica, hydroxypropyl cellulose. NO sugar, starch, gluten, lactose, artificial flavours or preservatives. I take it with calcium to avoid upset stomach. My doctor has migraines and so do I so she takes 1000 mg of Magnesium at bedtime and it works for her. I would try anything as anyone with migraines can attest to and I tried Magnesium for 6 months now and I have gone from 3 to 5 migraines a week to one every 3 months or so. Truly amazing!!! A natural way to help with restless leg syndrome. When taken at night it offers a more restful addition to falling off to sleep. Delivered to me and helps to keep me healthy. What's not to like? I take calcium supplements and find them binding. My pharmacist recommended adding magnesium to my diet.Presto! all my troubles are gone. The 250 mg size Jamieson makes is just perfect. Have been using this for muscle cramps for about a year. Haven't had a major spasm in all that time!! No issues with this product at all. I take it before bed for muscle cramps and it works well. Good quality supplement, I take this for fibromyalgia and my husband for more energy. I did a lot of research before choosing this product. I was looking for malic acid as it is recommended for fibromyalgia. I couldn't find any product that said malic acid on it. Magnesium malate combines magnesium and malic acid (which this product has). I use this product to lessen my symptoms of fibromyalgia and it helps me sleep much better. I take one tablet at bedtime every night and sleep like a baby! It has also helped tremendously with reducing headaches. I need to drink a lot of milk, but it was giving me back spasms. Apparently the problem was that I didn't have enough magnesium which is needed to break down and metabolize the calcium. After a a couple weeks on Jamieson High Potency Magnesium, problem solved! I use magnesium as a means of reducing migraines. I take two tablets a day. When I took it in the past, I was migraine free for 3 months! It really works. I've been taking this magnesium for 15 years to help me relax and also not to get foot cramps. it has also helped tremendously for my parents' cardiac conditions and to have healthy hearts. can never do without this. well.ca prices are lower when on sale. I have been using a magnesium supplement for several years. I use it to help minimize nighttime leg cramps, as well as the many other benefits this mineral provides. The Jamieson product sold by Well.ca fits my needs perfectly, and at the best price. 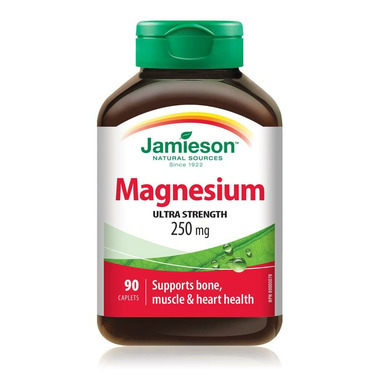 Jamieson magnesium: I took this product to help with bowel movements. I was having one bm every 5-6 days. After taking this product I now have a bm every 1-2 days. Thanks. Been using these for years! Since I require a high dose these 250 mg tablets are the easiest and best I've found.